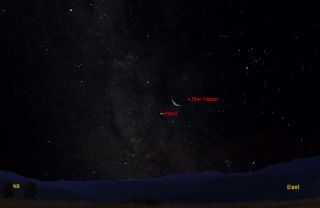 This sky map for July 27, 2011 shows how the waning crescent moon and Mars will appear at about 4 a.m. local time in mid-northern latitudes to skywatchers with clear weather. We haven't mentioned many viewing tips for the planet Mars very much during this year of 2011 and with very good reason. Up until now, the fabled "Red Planet" has been difficult, if not impossible to readily see. When Mars is at or near opposition to the sun in the sky, it shines brightly and remains in the sky for practically the entire night. But this is one of those years when Mars is between oppositions, and up until now it has been relatively dull and uninteresting. The last opposition was Jan. 29, 2010 and Mars spent the rest of that year receding from us, and it continued to recede until Feb. 4 of this year, when it was on the opposite side of the sun as seen from Earth. From then on through the rest of this year, Mars is appearing to draw slowly nearer to us. What is really happening is that the Earth, in its smaller orbit, is overtaking Mars. Now, in late July, when the Northern Hemisphere is tilted sunward, we are seeing Mars near the northernmost part of ecliptic (the path the sun follows in the sky) near the border between the winter constellations of Taurus and Gemini. But the Red Planet is only visible in last few hours of the night before the sun comes into view. This sky map of Mars and the moon shows how they will appear on Monday. Mars is now rising at around 2:45 a.m. local time and on Wednesday morning it can now be readily identified sitting about 4 degrees below and to the left of the waning crescent moon, which will be just 13 percent illuminated, looking like a narrow lunar sliver. Your fist held at arm's length covers about 10 degrees of the night sky. You might also notice the phenomenon known as earthshine: sunlight reflected off of the Earth and re-reflected back toward the moon. That eerie blue-gray glow apparently lighting up the dark half of the moon is sunlight that has bounced off the clouds and oceans of our home planet and directed up to the moon. Observe the moon with a small telescope or binoculars and this effect will impart a striking three-dimensional appearance. Astronomers measure the brightness of sky objects in terms of magnitude, with lower numbers of magnitude corresponding to brighter objects. At a distance of 199 million miles (320 million kilometers) from Earth, yellow-orange Mars shines at magnitude +1.4. As Mars appears to slowly slip closer to us with each passing night, it is swelling toward its next opposition which will happen on March 3, 2012. By then, Mars will have brightened up to magnitude of -1.3, just a trifle fainter than Sirius, the brightest star in the sky. Put another way, Mars will appear 12 times brighter than it appears now. Think about that when you look for it near the moon early on Wednesday morning.